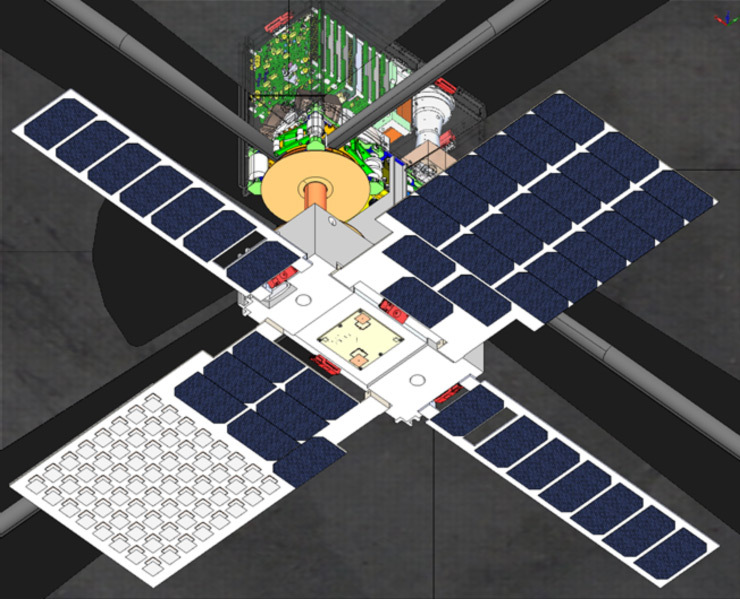 Figure 1 Preliminary spacecraft configuration. The solar sail is deployed from the central ‘2U’ portion of the 6U cubesat. Shown are the four booms that form the sail support structure. A cubesat-scale solar sail propulsion system is being developed at NASA Marshall Space Flight Center (MSFC) to provide propulsion for a 6U interplanetary cubesat to be used for the Near Earth Asteroid Scout (NEAS) project. NEA Scout will fly on the Space Launch System (SLS) Exploration Mission 1 (EM-1) mission scheduled for launch in 2018 and is being developed in collaboration with NASAs Jet Propulsion Laboratory. The solar sail will be allocated the mid-2U stowage volume within the 6U spacecraft bus. NEAS will perform a slow flyby of a NEA within approximately two years of launch. The deployed sail area will be approximately 86 square meters and has a tentative mass allocation of 2.5 kg. Once ejected from the SLS, the NEAS will perform systems checkout and then subsequently deploy the solar sail (nominally within 3-4 days after launch). The solar sail will provide the primary source of flight system V. If the spacecraft is still functioning after the asteroid flyby, then an extended mission to visit a different NEA will be considered. NASA MSFC desires for the solar sail technology and design being developed for the NEAS mission to be commercially available after the completion and delivery of the flight system hardware in 2018. To further that goal, NASA MSFC may discuss providing the solar sail propulsion system design to interested commercial entities. Please contact NASA MSFC, following the instructions below, if your organization is interested in being a commercial provider for future solar sail propulsion systems. The solar sail is based on the technology developed and flown by the NASA NanoSail-D. Four 7.4 m stainless steel Trac booms wrapped on two spools (two overlapping booms per spool) will be deployed by a motor from within the allocated cubesat volume. The booms will pull the sail from its stowed volume as they deploy. The sail material will be 3 micron CP1, an aluminized polyimide that was extensively tested for solar sail applications and used in NASAs 400 square meter solar sail ground demonstrator project. The solar sail will be stowed spooled, rather than z-folded. Processes related to the fabrication of the booms and substrate material will not be provided as these are commercially available piece-parts used as part of the integrated solar sail system. The baseline reflective sail area required to meet the missions delta-V requirements is 78 square meters. Since part of the sails surface will have its reflectivity reduced due to structural reinforcement needs, and taking into account that a few small tears in the sail are almost inevitable, the actual deployed sail area will be approximately 86 square meters, providing some propulsive margin. A NEAS illustration is attached to this announcement. Responses to this NOTICE should be no more than seven pages in length, not including any letters of commitment from sponsoring or partner organizations. Pages in excess of the page limitations for each section will not be evaluated. A page is defined as one (1) sheet 8 1/2 x 11 inches using a minimum of 12-point font size with normal kerning for text and 8-point for graphs. Responses should not include proprietary information. Page 1: Cover page including: Name of organization; Mailing address and phone number of organization; Web site of organization (if applicable); Name, mailing address, e-mail address, and phone number of primary officer of the organization; Name, mailing address, e-mail address, and phone number of organizations point-of-contact for the response (if different from primary officer). Page 2: Briefly describe your organization, including history, primary activities, interests, capabilities, and financial and personnel resources. Include any experience of the organization that is similar or analogous to solar sail technology and that demonstrates competence, integrity, commitment to safety and ability to work cooperatively in partnering arrangements. List any current or previous (for the past five years) contracts, grants or agreements with your organization and any federal agencies that exhibits these abilities or that relates to solar sail technology. Please provide customer points of contact and how to reach them (phone and email). Page 3: Describe your organizations interest in solar sail technology and your reasons for wanting to be a provider of it. Describe any goals that you would have for the technology - above and beyond those of direct potential NASA interest. Pages 4, 5 & 6: Describe your organizations desired approach to commercializing the technology, and maintaining its capability to reproduce, fabricate and deliver space-qualified solar sail propulsion systems to future government and commercial customers. A discussion of what your company might contribute in-kind before the NASA MSFC Solar Sail propulsion system is complete that would facilitate its development and future commercial availability is also requested. Page 7: Describe your companys/organizations ITAR compliance status. Is company registered with the US Department of States Directorate of Defense Trade Controls? (http://pmddtc.state.gov/registrati on/index.html ) Are any non-US persons employed by the organization? The U.S. Government requires all manufacturers, exporters, and brokers of defense articles, defense services or related technical data to be ITAR compliant. All responses to this NOTICE, including signed letters of commitment, must be submitted in a single PDF file as an attachment to an electronic mail message to Belinda Triplett at belinda.f.triplett@nasa.gov . Paper submissions will not be reviewed. Please include Notice Reference Number in the subject line of the e-mail.